The mini-eductor is one of the most valuable pieces of equipment at your disposal for sampling ambient air, process lines and vessels, vent stacks, ovens, dryers, incinerators, vehicle exhaust and a myriad of other uses. 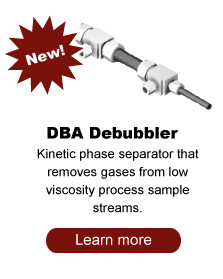 They are used from aspirating and venting to mixing gases and liquids and diluting samples. The mini-eductor uses pressurized air (or N2, Ar, process gas, …) or water (or other process liquid) to produce a partial vacuum that draws the sample to your analyzer or monitor. With no moving parts this intrinsically safe device is a reliable part of any sampling system. It requires no maintenance and costs little to purchase and to install. The efficiency of mini-eductor is such that the on-going service cost is equivalent to or less than the cost of electricity used to run a mechanical pump. How do I install an eductor? Many designers of sample systems are not familiar with the eductor and are not sure as how to best use the mini-eductor in their sample system. Below are a few applications with guides for installation. For the majority of applications the installation is very simple. As illustrated below the sample gas intake at the eductor is connected downstream of the analyzer, pulling the gas from the sample point through the monitor or analyzer. It is recommended that a needle valve or sonic choke be used to regulate the flow. Since the pressure drop takes place at the needle valve, there is essentially no drop in pressure in the analyzer. Therefore, there is no effect on the measurement (tested for flow rates up to 10 LPM through ¼’ tubing). A sample flow rate of 1 LPM through 100 ft. of ¼” line will deliver a fresh sample to the analyzer within 30 sec. It is also advisable to incorporate a flow switch downstream of the analyzer to alarm on loss of flow, especially if the system is used as a safety monitor. 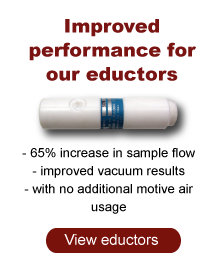 There are many useful applications of the mini-eductor where a partial vacuum is required. For example, in the laboratory an eductor can be utilized for filtration or vacuum distillation. Controlling the vacuum level may be as simple as setting the pressure of the motive air supply. Especially when organic vapors are involved, a mini-eductor may be the better choice over a mechanical pump. Pump oil can get contaminated possibly leading to pump failure, and the pump exhaust needs to be directed to a safe location or scrubbed. This is easily accomplished with an eductor. 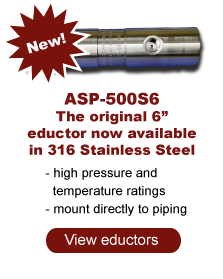 The mini-eductor is an inexpensive alternative to the mechanical pump with the added benefits of being intrinsically safe and requiring no maintenance. For tighter vacuum control the illustration below shows a simple and convenient system for vacuum control. This method has been widely used and has given dependable performance. When the eductor is used to withdraw samples from a source which is either at atmospheric pressure or less than atmospheric pressure, the eductor must produce a partial negative pressure to induce the sample to flow into the analytical cell. To assure accurate analysis it is sometimes necessary to control the pressure. The system illustrated above has been successfully used for many years to maintain a constant pressure for analysis. Often times it is necessary to vent the mixed gas from the eductor to a flare or destructor. Feed streams to the flare will be above atmospheric pressure. To overcome the backpressure effect the motive air will need to be adjusted to a higher pressure. The curves below illustrate the performance of the Motiv-Air-Torr at three different backpressures (5 psig, 10 psig and 15 psig). You will note that as the backpressure increases the motive air pressure must be increased. For these or higher back pressures use model ASP-520R-S-4. This model also produces higher sample flows. Sample pressure can also have an effect on the performance of this eductor. The curve below illustrates the effect of increasing the sample feed pressure to 5 psig. The backpressure is at 15 psig for both curves. As you can see the sample flow increases significantly. If the process fluid is at an elevated pressure, the process fluid can be used as the motive force for the eductor. After the sample has been analyzed both the sample portion and the motive portion can be combined and returned to the process. This requires a return point which is at a lower pressure. This can be especially useful when the safe operation within an analyzer house is considered, e.g. analyzing a benzene stream. There are many instances where a single analyzer is used to analyzer multiple points. This saves significantly on capital costs but presents more stringent requirements for the sample system. Each of the samples must reach the analyzer in a timely manner so a manifold system must be designed to meet the requirements. The design must also eliminate dead legs and cross contamination, especially if there are wide swings in concentration of the analyte. The double-block-and-bleed system illustrated below meets all these requirements while minimizing potential maintenance. The use of an eductor simplifies the system when compared to use of a mechanical pump. In all of the above applications the Motiv-Air-Torr offers several advantages over the competitor’s devices. As illustrated in the chart below, our eductor reaches higher vacuum at lower motive pressures. This means that lower pressure services can be used, and there is a significant savings in air usage. Because the Motiv-Air Torr is fabricated into a tubing Tee, no additional fittings are required. 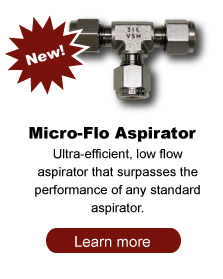 This eliminates additional parts, reduces fabrication labor and reduces potential leak points. Several configurations of the tee fitting as well as materials of construction are available.